As an early childhood professional and Christian, it is important for me to dispel the widely held myth that God wants us to spank our children. Leaving infants to cry-it-out is another big trend within some Christian circles. Neither of these practices are Biblical, and are actually quite damaging to the young brain. This is why I wrote the book, Gentle Firmness. Christian parents need to be informed that the mainstream Christian parenting advice is not only not Biblical, but it deeply scars their children. With my deep love of young children, I have always struggled with the rod verses in the book of Proverbs that seem to advocate spanking children, because seeing how children react to being spanked, and knowing what I know about how young children learn, it just never made sense that God would want children to be spanked. For example, I saw the heartbreaking event of a wonderful Christian mother who truly wanted to do the best for her children, slap her toddler’s hand for the first time because he kept touching something she didn’t want him to. It took a couple slaps before he confusingly looked at his stinging hand then at his mom to try to figure out why she hit him. I’ve also seen children “lovingly” spanked and still freeze up when they disobeyed. Interestingly, when positive discipline was used with these children, they cooperated. Another thing is that if God truly wanted children to be spanked, there would be zero neurological, psychological, or spiritual harm done to the children. But research shows otherwise. Even so called “lovingly” spanking is very harmful. And if some Christians are wary of research, many researchers actually are Christians. I cover this research in depth in my book. Romans 1 says we can learn much about God by looking at His creation. I can also attest that leaving infants to cry-it-out always harms as crying is the only way infants can communicate. Sure, they eventually stop and “sleep” when left to cry-it-out, but it’s not the healthy sleep people believe it is. Rather, their brains are literally shutting down from stress. Then the learned helplessness sets in. Infants learn to mistrust themselves and their caregivers when their cries are not consistently and respectfully responded to. Just because allowing them to cry “worked” and they appear fine, doesn’t mean damage didn’t occur. As an early childhood professional, I cannot recommend cry-it-out ever. Infants need a response when they cry. A little fussing with our support as they fall asleep is ok, but ignoring their outright cries is not. Understanding child development is crucial to disciplining children appropriately. When we see that God actually created children to go through each developmental stage, we can figure out kinder, merciful ways of guiding them through each stage. The Bible says that children are blessings from God in Psalm 127:3. Yet, more often than not, they are treated as little sinners in need of the devil beaten out of them. Jesus says we are to be like children in order to enter the Kingdom of Heaven in Matthew 18. Jesus raised the status of children. I also discuss attachment theory in my book as God created infants to cry in order to communicate with us. Crying is never manipulative for infants 12 months and under. God always hears and comforts us when we cry out to Him. We must do the same for our children. The reason I named my book “Gentle Firmness” is that discipline must be gentle but firm in order to be effective. If discipline is only gentle, then it’s too permissive. If discipline is only firm, then it turns into punishment. Children need gentle but firm discipline. The principles of Attachment Parenting encourage gentle but firm discipline for all children. 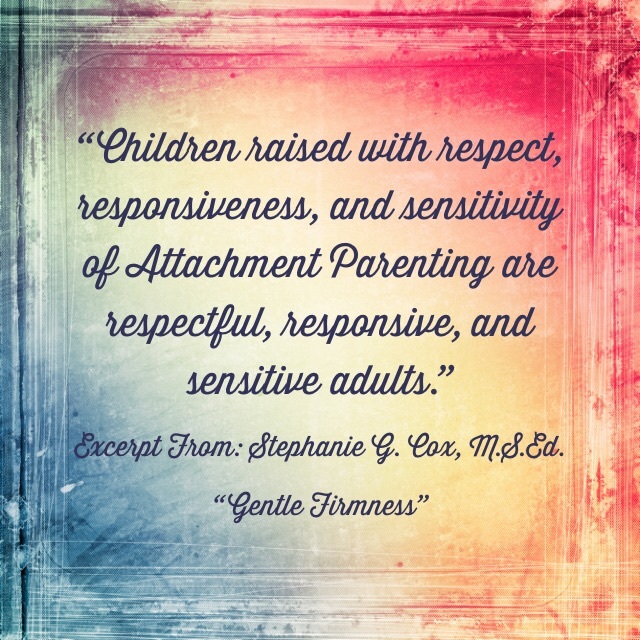 All children deserve sensitive, respectful care.